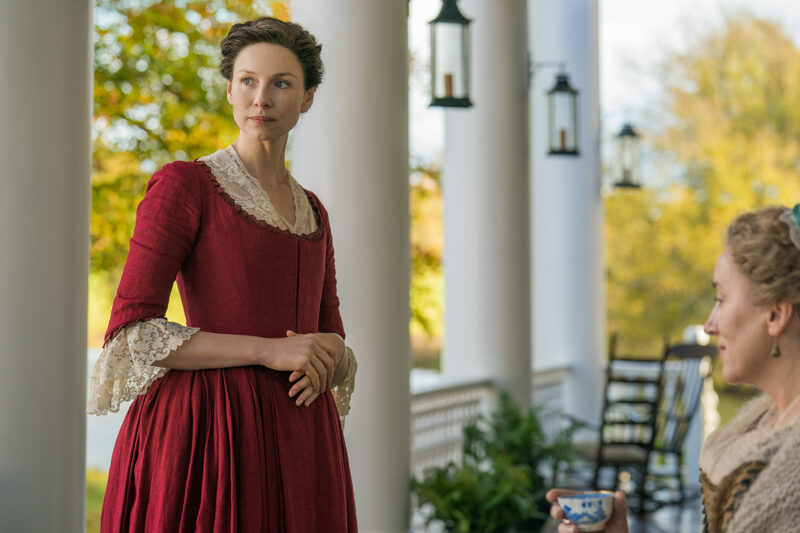 During the much-discussed end of Outlander’s fourth season premiere, the ironic use of Ray Charles’ modern version of “America the Beautiful” played over the scene of the soulless outlaw Stephen Bonnet’s attack on Jamie and Claire Fraser, family and friends. The message, as Jamie noted: the American Dream can, for some, turn into a nightmare. 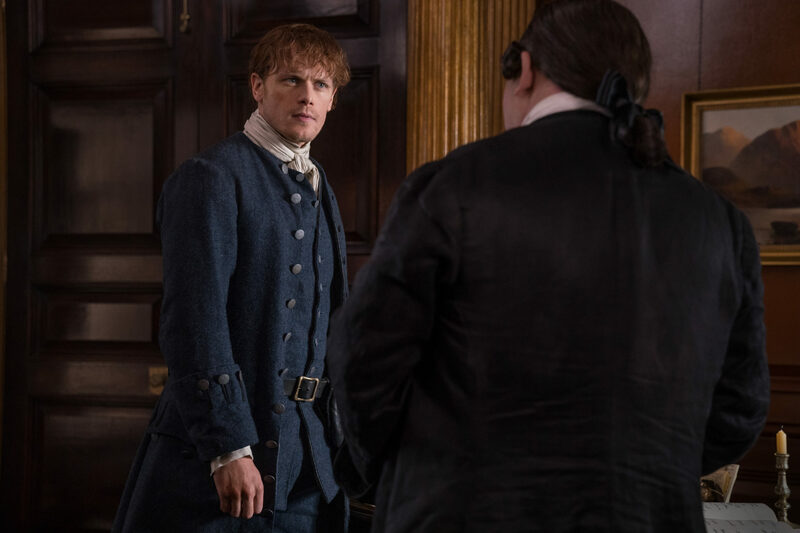 There was nothing romantic about the murderous assault…and this Sunday, November 11 (STARZ, 8pm ET/PT), the horrific struggles for the Frasers in this fraught new world continue. 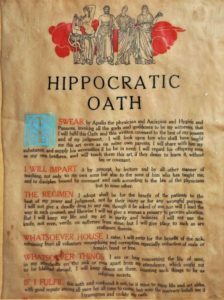 Episode 2, “Do No Harm,” begins with Jamie and Claire’s arrival at Jocasta McKenzie’s plantation, River Run. Jamie hasn’t seen his aunt, his mother’s sister, since he was boy, but she welcomes her nephew and Claire to live with her indefinitely, even though they are now penniless thanks to Bonnet’s attack. The beauty of River Run is marred, however, when they are jolted by the reality of this North Carolina—slaves serve Jocasta’s household and toil in the fields—something Jamie, who remembers all to well what it means to be dominated and mistreated, and Claire, who understands the history of oppression that took a civil war to change, are not willing to accept. Again, to avoid spoilers, suffice it to say that their resistance to this troubling way of life creates an upheaval before they have even managed to take advantage of Jocasta’s generous offer to stay at River Run. 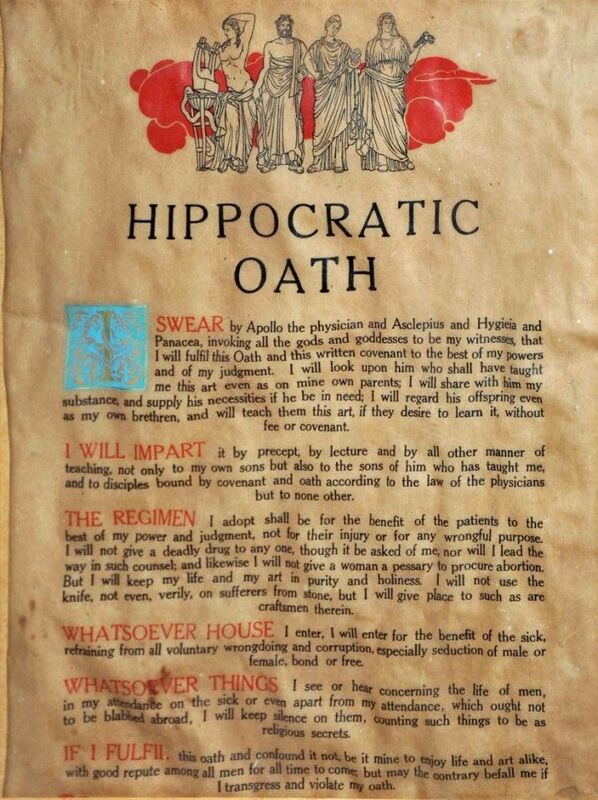 Everything they believe, everything they have learned, and ultimately, Claire’s Hippocratic oath, is put to the test. 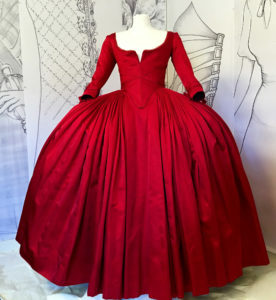 There are many Outlander fans, who often watch episodes and seasons over and over again, who have written in social media posts about their reluctance to view Season One’s “Wentworth Prison” more than once. 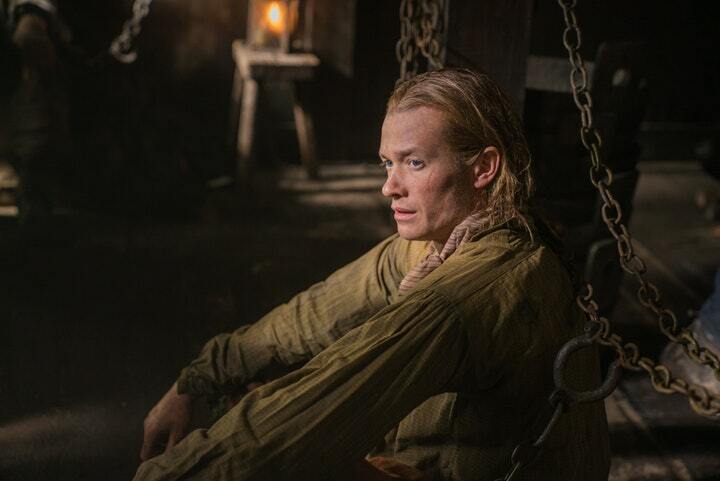 In that episode, Jamie is broken by his psychopathic nemesis Black Jack Randall. The British Captain of the Dragoons beats, tortures and rapes the Highlander, who refuses to bend to Randall’s will until he has no choice —he finally agrees to submit to Randall in exchange for Claire’s safety. For many reasons, “Do No Harm” may be equally difficult to rewatch. There are moral dilemmas that may not involve torture, but can scar. 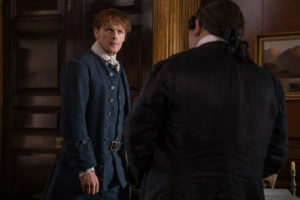 This episode ends with Claire in the crosshairs, faced with as horrific a decision as Jamie was forced to make , which undoubtedly will cost her a piece of her soul. 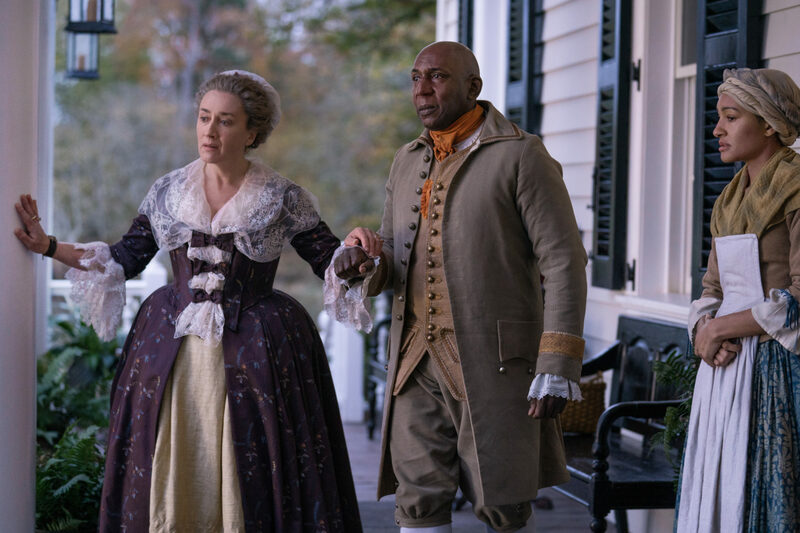 As anticipated, Episode 402 introduces the accomplished Maria Doyle Kennedy (Orphan Black, Downtown Abbey, Dexter, The Commitments, The Tudors) as Aunt Jocasta. 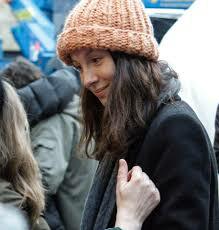 (It is best to remember she is a MacKenzie, of the same manipulative stock as her brothers Dougal and Colum). If you enjoy seeing actors transform themselves from role to role, you have only to check her out in the delightful Irish detective series Striking Out (Acorn TV, available by subscription via Amazon Prime Video). Colin McFarlane (Batman Begins, The Dark Knight) also stars as the River Run houseman, Ulysses, who serves and protects Jocasta but also understands Jamie and Claire’s perilous position in the household and in a community that has no interest in change. The performances and the production values continue to be top-notch, including the work done by Outlander co-costume supervisor Terry Dresbach, for whom Season 4 is her last. 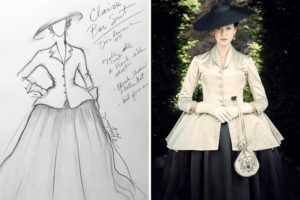 Her breathtaking designs over the past five years have earned her two Emmy nominations in 2016 and 2018, an avid social media following, and museum costume displays in Los Angeles and other cities. Her Outlander America work continues to show the attention to detail for which she is known and admired. relevant score has done across all four seasons. The song “America the Beautiful” had the opposite effect. It took many people out of the scene. Perhaps it was because the jarring jazziness of the Ray Charles version clashed with the time period and wound up competing with the shocking series of events tripped into motion by Bonnet and his henchman. What you never want is for a creative decision to undercut a pivotal moment such as this final scene. I admire the risks taken by the Outlander creative team, but not all of them work. 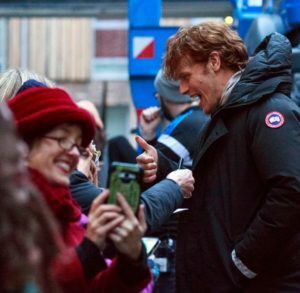 Fans also found fault with the green screen work in “America the Beautiful,” which was puzzling, given the gargantuan task Outlander faced in shooting Scotland for North Carolina. The misplaced geographical references were also an issue for viewers who know where the Blue Ridge Mountains and Cape Fear river are on the map. It’s worth mentioning that Outlander takes typical liberties with settings and geography as most television shows, and does a better job of it than many. Those moments can be disconcerting, but they’re not done out of ignorance or sloppiness—it’s a production compromise. 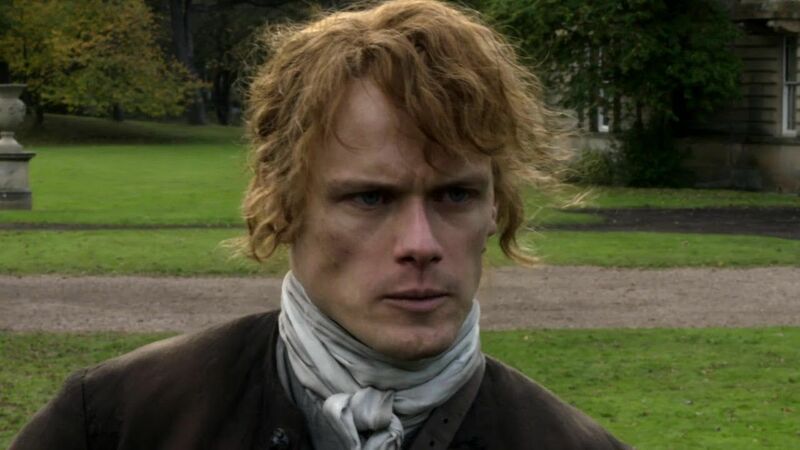 One last thing: As I’ve noted in my coverage of Outlander, I am new to the show. There’s so much TV to watch that it took some enforced downtime with a broken ankle for me to binge the series, which had been on my list for a while, just in time for the arrival of Season 3. I hope, since I’ve spent my entire professional life in the television world at a very high level, what I bring to checkyourlocallistings.com is that insider perspective. Visitors here seem to like it. So here’s what I can tell you about Outlander beyond the episodes I review. I have worked with countless executive producers and talent and I have NEVER witnessed the level of engagement Outlander producers, actors and crew offer to their fans. NEVER. Their graciousness and willingness to share in interviews and on social media goes above and beyond. I admire them for it. As a publicity exec, I would have killed for this kind of cooperation from my shows. Most of the time, I had to “persuade” top producers and actors to do interviews, go on tour, pose for photographs, interact with large groups of admirers beyond obligatory new season responsibilities. And to ask them to do this stuff on their hiatuses? Rarely happened. I would hate to see the nasty minority in Outlander fandom undercut a lovely relationship. The generosity of the Outlander creative team should not be taken for granted. So please, think before you speak, tweet, post. Actors and producers are people too. You can take issue with an episode, a line reading, and adaptation choice, a wig, or a costume without being vicious. A world has been created for you, and it won’t last forever. Live in it kindly. What a great message, thank you. I’m a devoted Outlander fan ,and certainly appreciate what the entire production team and cast members do for the fandom. Let’s hope those few who use those painful word’s ,will begin to understand, just how much everyone involved with the series goes above and beyond for us. Thank you, Susan. I appreciate the feedback. Based on ongoing comments I’ve read this week, there are many unhappy book readers who continue to slam the efforts of the production team. What can you do? They don’t seem to understand there’s no creative plot to wreck the series. The books are the books, the show is the show, and sometimes the twain will not meet. I read alot of the stuff you are referring to and am quite horrified. Anonymity of SM has reduced many to uncivilized discourse. I have read all the books and love them. I have seen all episodes and have loved them. My personal opinion is the show is the best production across the board ever on television. I hope everyone involved can read comments like this and know that their are appreciative people out here who enjoy their immense talent and contribution to our entertainment. Thank you, Rebecca. Obviously, we agree. I was disturbed to see Matt Roberts tweet a warning that he would block anyone who attacks cast or crew on twitter. This is just wrong.